YouTube is a fantastic way to keep your kids entertained with a tablet or smartphone, but it’s also a little concerning. You just never know if your child will end up using the suggested videos feature to jump from Sesame Street’s Elmo to a drunk Elmo parody, or view inappropriate advertising. 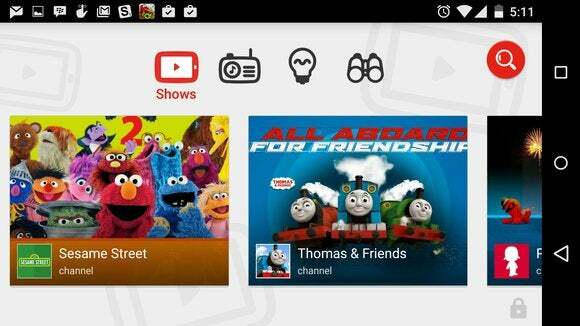 Google is aiming to solve that problem with a new app called YouTube Kids available on Monday for Android and iOS. The Kurio and nabi kids’ tablets will also receive the app in the coming weeks. Early reports about the app surfaced late last week, but details were a little thin. Now that the app is available we can say that at first glance this app should appeal to parents and kids alike. Why this matters: As we reported last week, YouTube is big with kids, now more than ever. YouTube’s “family entertainment” channels grew by 200 percent year-over-year. But until now YouTube wasn’t doing enough to properly cater to this segment. With YouTube Kids, Google’s doing a far better job of meeting a fast-growing demographic. And it’s not stopping with videos: Following YouTube Kids, Google has plans to roll out kid-friendly search and Gmail. When you first start up YouTube Kids on Android it doesn’t ask you to sign-in with a Google account. Instead, the app displays a selection of kid-friendly shows. Each show is represented by a large tile that is easy for kids to tap on. At the top of the screen are four basic icons to check out shows, music, educational programming, and an “Explore” icon for perusing kid-friendly YouTube channels. Shortly after you start using the app a “Recommended” icon will also pop-up. On the far right there’s a search icon. Kids who can read and type will be able to tap their search query on the keyboard. Smaller children can tap the microphone icon and search with their voice—results will vary depending on annunciation, naturally. YouTube Kids does a good job of keeping mature content away from young eyes. Taking a quick look at the content on YouTube Kids it appears the site has done a good job of filtering out inappropriate content. This is not just a YouTube app with a kid-friendly overlay. Search for adult content like Fifty Shades of Gray or your favorite late night talk show and you’ll be denied. And yes, drunk Elmo is also out of bounds. YouTube has partnered with a number of popular child-friendly shows and content companies including DreamWorks TV, Jim Henson TV, Mother Goose Club, and National Geographic Kids. 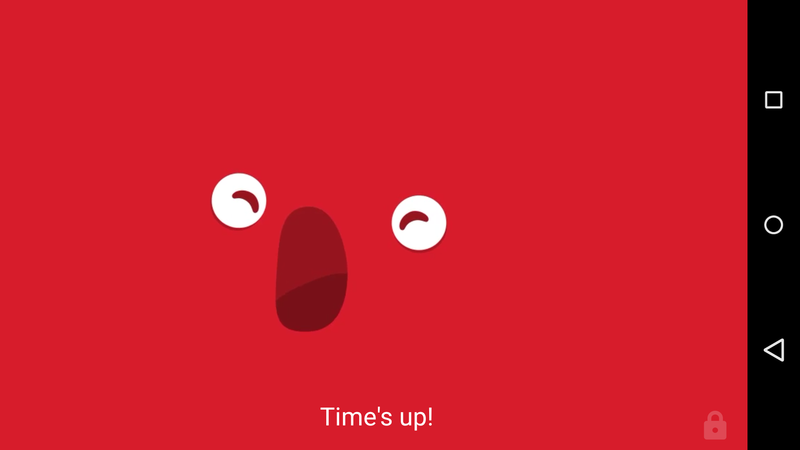 YouTube Kids goes to sleep when the timer is finished. For parents, there are also nice features that let you have a say in your child’s viewing experience. Most importantly, there’s a timer that will automatically stop the app after a predetermined viewing period. The app defaults to 30 minutes, but you can change it to anything from one minute to two hours. Once the timer is done the app has a little animation that shows it going to sleep. There are also settings to turn off the unfortunate background music that plays when a video isn’t being watched. The same goes for the sound effects that occur with every tap on a video or icon. These "features" will probably drive you nuts very quickly. To change them tap on the lock symbol in the lower right corner, enter the required pin, and then tap the settings cog. On the next screen you’ll see check boxes to disable the two features. YouTube Kids’ security features will keep children who can’t read out of the settings and timer features. To change the app’s settings or exit sleep mode when the time is up you have to enter a pin. Instead of forcing you to remember yet another four-digit combo, the app asks you to enter a numeric code that is written out as words such as “two, four, nine, zero.” For most parents that security feature will stop being useful somewhere between the ages of four and six, but it’s a nice thought. YouTube Kids is a free download and is currently free to use. But we noticed during our brief time with the app that advertising was limited. I didn’t personally see any ads, but my editor saw a kid-centric Khan Academy ad several times. The lack of ads raises the question of whether this app will become YouTube’s next subscription-based venture in the coming months.